Zombie Cinema is a relatively simple game, and one you shouldn’t be afraid to make your own in practice. People create their own house rules to games all the time for different reasons. Here are some of mine that I’ve considered in different circumstances. The following little ideas do not impact the flow of the game in a major way – they’re just small details that an individual group might wish to fiddle with when looking to fine-tune the instrument that is the game. The players may agree on any of these minor variants before the game begins. Players may sacrifice pawn position on the board normally, but they may also do it to move another player’s pawn down, towards the zombie pawn. The player is required to narrate a revenge scene. The round marker stays with the starting player and does not move on ties. The zombie pawn moves normally, and might even move twice in succession when there is a tie during the turn of the last player during a round. Players can always declare conflict against the zombies, but only if the active player agrees to roll for them in lieu of participating in the conflict in other ways. The active player’s own character pawn is not affected by the conflict in any way, of course. Sacrifice can only be declared in between player turns. The zombie pawn starts the game outside the board and enters the first space on its first move. Players cannot declare conflict before the zombie pawn enters the board. When it comes to setting work, the simplest way to adapt Zombie Cinema is with a new game board. Some trivial transformations hardly even require switching the board: an Alien game goes off just fine on the default board, for example! Some other variants require a bit more thought, in which case a new, nice-looking board is just the thing. The following are a couple of examples I made. Print them out, laminate perhaps, and put them into your Zombie Cinema box to wait for an opportunity to play. I have the original game board here as well in case you lose yours somewhere or something. Isn’t it purty? In Heist Cinema the player characters are all crooks out for a score to make their careers. Usually police, other criminals, betraying girlfriends or such prevent the crime from ultimately paying off, but sometimes, just sometimes the crook is the one who walks off with the gold… Movies like Italian Job, Ocean’s Eleven and the indomitable Reservoir Dogs are the inspiration here. The zombie pawn has been replaced by a cop pawn here appropriately enough, as the long arm of the law is the greatest threat the crooks have in their way. Should the cops capture a player’s character pawn, he gets to describe how his character is arrested, turns informant or even dies in a glorious firefight with the cops (or other criminals, as the case may be). Should a character reach the escape space on the board, he got away or made a deal to preserve his freedom – whether with loot or without is found out through play. 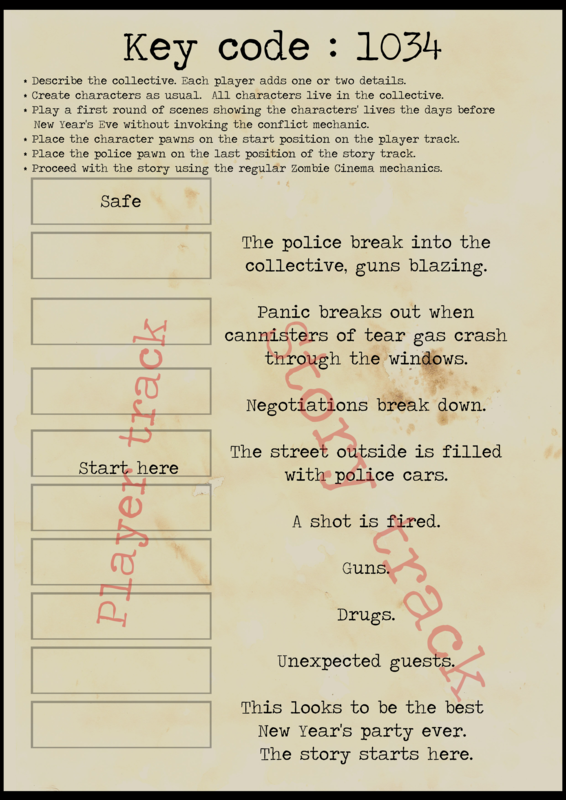 Unless you want to create your own Cinema Cards to inspire suitable criminals, it might be a smart idea to begin the game by creating just one character for the player who begins the game and then find out what the heist will be. Then the other players can introduce their characters who take appropriate specialist roles in the score. In general, following the heist movie formula (planning the heist, executing the heist, driving down a cliff after somebody betrayed the operation) will provide a lot of support for play, just like the zombie genre does in Zombie Cinema. In Mythos Cinema the player characters are well-bred dilettantes, desperate lower class occultists, semi-mad cultists, the occasional police or other characters well suited to the stories of the good ol’ H. P. Lovecraft, Gent. There is no strong movie tradition behind this board, which makes it rather exciting – the players have to figure out for themselves what a demented brew results from mixing Cthulhu Mythos with Zombie Cinema! My personal inspiration for this is the excellent Acts of Evil by Paul Czege, a game about power-mad cultists competing for the ultimate occult power through time and space. The zombie pawn is replaced here by the Cthulhu pawn, who is obviously enough going to make irredeemably mad and/or dead anybody unlucky enough to encounter him. Characters who escape, on the other hand, are those who’ll get to write the diaries and correspondence that form the basis of so many beloved Lovecraft stories. When framing scenes and being the active player, consider pacing carefully, but do not be afraid to introduce horror glimpsed from the corner of the eye. Remember, however, that the real “reason” for why this character here got eaten by the grue was not that the grue was introduced in act 1 – the death was just a poetic counterpoint to the character’s unfortunate choices in meddling with things man was not meant to know. The monster is often the last thing you need to introduce to the story after the fevered motivations, philosophical ideas and scorned social relationships are in place. Wilhelm Person’s Keycode 1034 is a catastrophe movie about the greatest/worst new year’s party ever. The player characters form a commune whose new year’s party gets out of hand as the long-term personal passions rise to the fore. The police has a good chance (read: virtual certainty) of showing up as the party snowballs into a veritable bacchanalia. Who will get arrested and who will get out of trouble scot-free? More significantly perhaps, is anything learned? Arpie made a variant board for Doctor Who – or rather, innocent bystanders getting mixed in with the alien invasion of the week. Having both the alien invaders and the Doctor in the mix provides the players with a prominent non-player character to play with in various ways. Quite nice! I discuss a pretty extreme trait makeover variant at my own blog. Adding traits to the game makes it more like a traditional roleplaying game in some ways, while allotting narrative power in some new, weird ways as well.